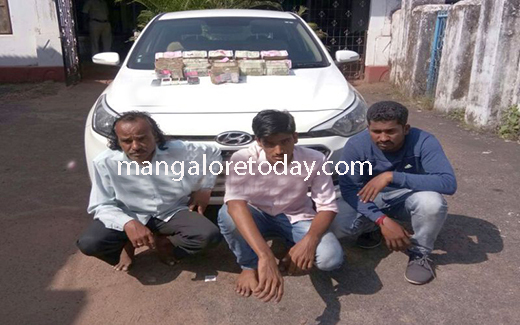 Mangaluru, Dec 08, 2017 : The Kankanady police on December 08, Friday arrested three persons allegedly transporting huge amount of cash without proper documents. Dinesh Prakash Sindhe(20) from Belagavi, Tanaji(54) from Maharastra and Amul Mali (29) from Sangli Maharastra are identified as the arrested. Kankanady police during partoling on early hours today waylaid a Hyundai I 20 car bearing number MH 10 CA 9908, have siezed Rs 1 Cr as they lacked the requied documnets used to transport cash.They have also seized mobile phones and the vehicle. Case has been registered , police will investigate the source of such a large amount of cash.